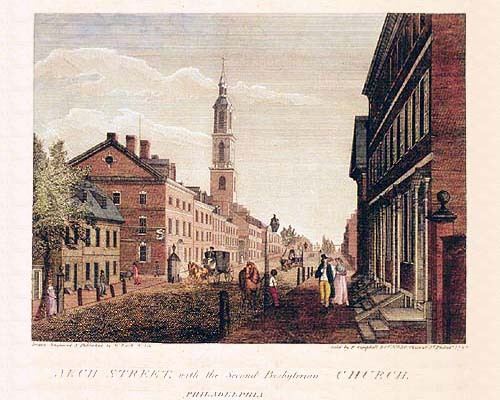 The Second Presbyterian Church was organized in 1743. In 1750-53 the congregation built its first structure containing an exceptionally tall slender steeple. The building stood on the northeast corner of Third and Arch Streets. 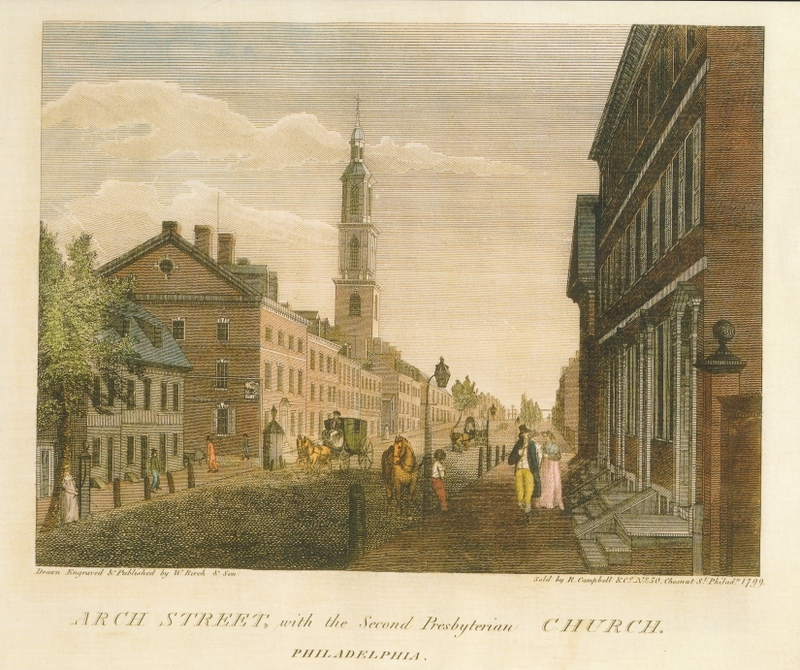 It was demolished in 1837-38 following the construction of the congregation's new home on Seventh Street below Arch. Many leaders in the cause of Independence were members of the church including Elias Boudinot, president of the Second Continental Congress. About 1794 a charity school was opened by the congregation. It was one of a number of such schools organized at that time. They were the forerunners of publicly funded elementary schools. By an act of the Pennsylvania Assembly in 1818 Philadelphia County became the commonwealth's "First (and only) School District " to provide inexpensive tax-supported education through the Lancastrian method, in which older children taught younger ones. Doubtful as to how much education child- ren were receiving, in 1834, the Assembly passed the Free School Law. As amended in 1836 it became the foundation of a statewide system of tax-supported schools with paid teachers. The Lancastrian method was abandoned and within one year there were 12,000.pupils being taught in more than fifty schools. Prestigious Central High School, the first of its kind in the country (originally located on Juniper Street east of Penn Square, now at Ogontz and Oloney Avenues), was also authorized by the act of 1836. 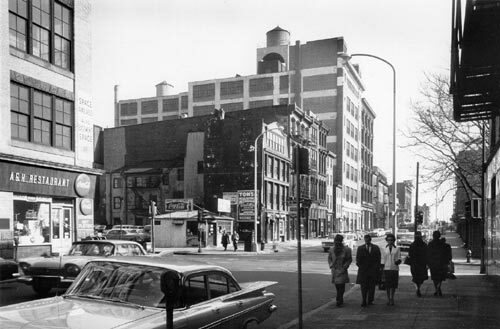 Commercial buildings near the northeast corner of Fourth and Arch Streets (BG 1960) were replaced by a fire-house erected in 1968 for Engine 8 and Ladder 2 of the Philadelphia Fire Department. 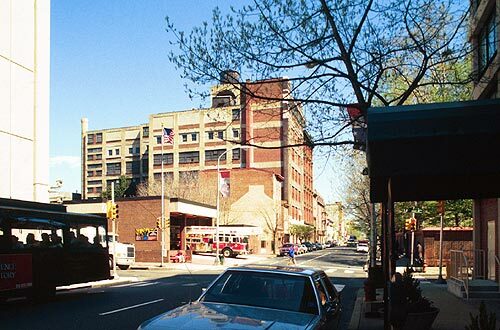 Engine 8 proudly traces its roots back to the Union Fire Company, the first in Colonial America, founded in 1736 by Benjamin Franklin and his friends.. On the northwest corner (2000 view FG-L) is the United States Mint, completed in 1969. On the southwest corner (FG-R) is a Holiday Inn, opened in 1973. Its canopy appears in deep shadow. Across Fourth Street (MG-R) is the brick fence that borders the Arch Street Meeting House of The Society of Friends. In silhouette (FG-L) is one of a fleet of buses that travels a tourist loop in Center City and Fairmount Park. Modeled after 19th century Fairmount Park trolleys, the buses were introduced during the Bicentennial.